When Ruth Reichl was 22--long before she became famous as a restaurant critic, magazine editor, and author--she taught cooking at a glassblowing workshop in the forests north of Seattle. The final week she was there, the wild blackberries ripened all at once, "soft, rich, and juicy," Reichl says. She picked until her pail overflowed. Then she baked into the night. In the morning, these flaky turnovers were her parting gift to the glassblowers. Put all pastry ingredients into a food processor and pulse until a dough starts to come together. Turn out onto a work surface, divide in half, and press each half into a disk. Wrap disks in waxed paper and chill for an hour (or up to a few days). Preheat oven to 375°. Line two baking sheets with parchment paper. If you've chilled the pastry for more than an hour, let it sit at room temperature 15 minutes. Meanwhile, mix blackberries with lemon zest, sugar, salt, and flour. 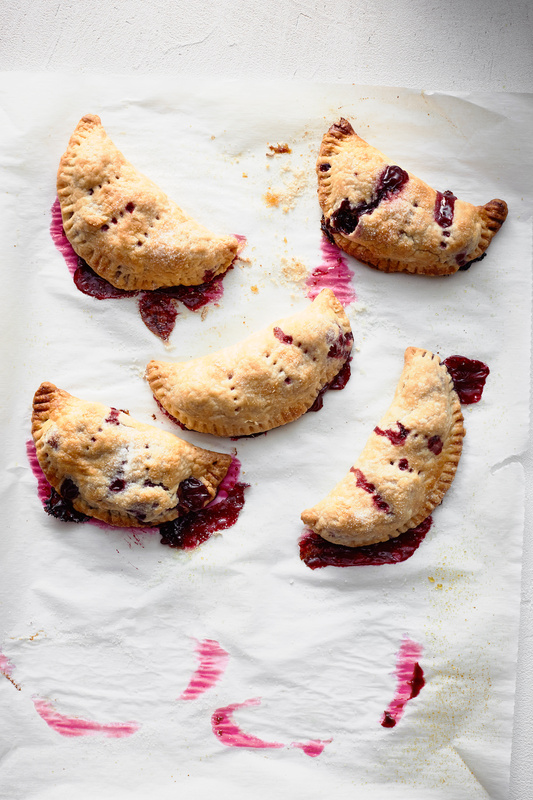 (If your berries are big, cut them in half so they'll be easier to wrap up in the pastry.) Don't let them sit for more than 1/2 hour or they'll get weepy. Roll each disk out on a floured surface into a 15-in. circle. Cut out rounds (I like them to be 4 1/2 in., which will make about 18 turnovers, but the size is up to you). The pastry is very forgiving--you can reroll the scraps and it will still bake beautifully. Transfer rounds to baking sheets. For each, put about 1 1/2 tbsp. blackberry filling on one half, fold naked half of pastry over, and crimp edges with a fork. Prick a few small holes on top for the steam to escape, brush with milk, and sprinkle with sugar. Bake turnovers until they have turned a beautiful golden brown, 20 to 30 minutes. Cool on a rack.